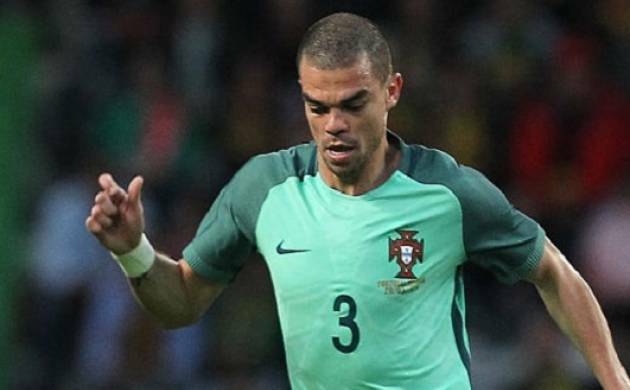 Centre-back Pepe missed Portugal’s training today for the Euro 2016 semi-final against Wales because of muscle pain, the Portuguese Football Federation (FPF) announced. Pulling the Real Madrid player out of training was just a precautionary measure ahead of Wednesday’s match in Lyon, the federation said. The 33-year-old was the only player missing from the session for Fernando Santos’ men. Midfielder Andre Gomes and left-back Raphael Guerreiro returned from knocks over the weekend. “I was pleased with the way all my players played, but I have to say that Pepe had a huge match,” said Santos, after Pepe’s performance in the quarter-final win over Poland on penalties. Gomes insisted that he had fully recovered from a muscle problem that kept him out of the Poland game and was ready for the Wales clash. “All the players who took on Poland did their best and played very well,” said Gomes. Portugal, led by three-time World Player of the Year Cristiano Ronaldo, are hoping to reach the final of a major tournament for the second time after their 1-0 loss on home soil in the Euro 2004 final to underdogs Greece. The only certain absentee is defensive midfielder William Carvalho, who is suspended, with Danilo Perreira favourite to take his place in the side. This could be the last chance for Real Madrid teammates Pepe and Ronaldo to finally claim silverware in international football. Ronaldo has had a difficult tournament, although he did score the two goals in the 3-3 group-stage draw with Hungary that dragged Portugal into the last 16. Wales manager Chris Coleman has two places to fill in his team for the semi, after Aaron Ramsey and Ben Davies both picked up suspensions with yellow cards in the stunning last-eight victory over Belgium. Arsenal midfielder Ramsey, who has scored one goal and made four assists in the tournament so far, is a big miss for Coleman, while Davies has also impressed. Leicester City’s Premier League winner Andy King is expected to come in for Ramsey, while experienced defender James Collins could replace Davies.